With an average eCOGRA-proven payout ratio of 97.18% for all games coupled with an impeccable reputation since 1998, Lucky Nugget is a perfect casino space for all kinds of players: complete beginners, seasoned pros and everyone in between. Roulette players are sure to appreciate a big range of about 10 roulette games developed by Microgaming, a premium gaming industry supplier. Design-wise, the casino is visually clutter-free and a bit minimalistic, without heavy flash animations and other elements that slow down loading time, which makes the casino’s website perfectly compatible with mobile devices. 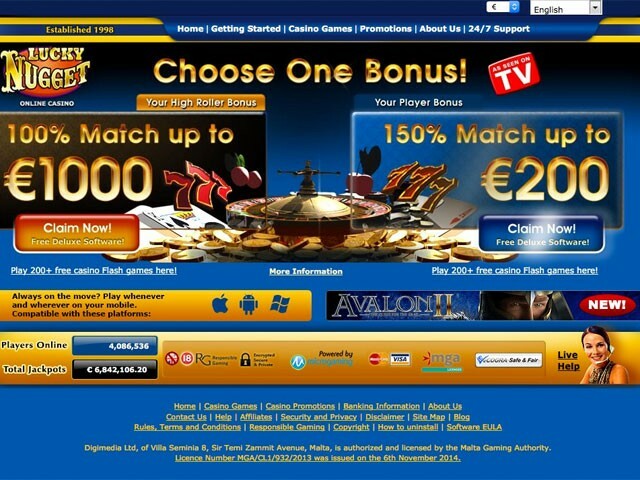 Lucky Nugget can be accessed instantly through a browser; alternatively a downloadable casino app is available which is installed on desktop devices. Depositing and cashing out options are displayed based on a user’s location, and include more than 20 international and regional payment services. The minimum deposit limit ranges from $5 to $20 depending on the option selected, but players who have just registered at the casino are entitled to fund their account with as low as $1. The minimum cashout amount is $50. Live roulette (released by Microgaming). Players earn 2 loyalty points for every $10 bet on roulette games. The loyalty points are redeemable at the rate of 200 LPs per $1. Other bonuses currently offered at the casino are not allowed on roulette games, so betting in roulette will not contribute to wagering requirements.